Stay always connected to 3 mobile networks in Philippines with Smart's first TRINET Plan 889. Where you can enjoy unlimited call and text to all your friends from Sun Cellular, Talk N Text (TNT) and Smart for only 899 pesos. The unli plan that has made even more powerful, plus you can get a free smartphone for 24 months contract period. 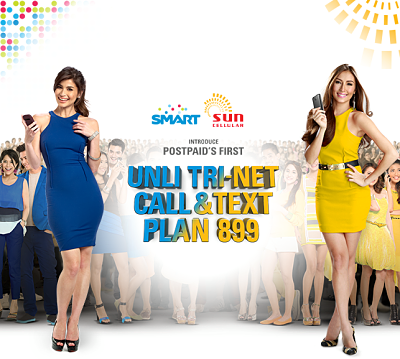 Texting not problem anymore and say goodbye to limited minutes of call when you apply for this Smart UNLI TRINET Plan 899. A very good deal if you want on a budget with your monthly communication allowance instead of availing prepaid call and text promo service. To make you even more interested with the Smart Postpaid offer we'll list down all the bundles you can have when you subscribe on this plan. Smart put up the list of available smartphone that you can get under TRI-NET Plan 899, please find list below for your reference. Do note that this list may change depending on the availability of the handset. You can also inquire and visit your nearest Smart Store for more details about this promo. To apply just bring the complete requirements like Proof Identity, Proof of Address and Proof of Income. Do note that all your applications are still subject for Smart’s approval.